A dry heave would probably be the appropriate reaction from a person witnessing for the first time the ancient practice of nasal cleaning. While it’s not a particularly pleasant event for a bystander, a good nasal cleansing session can lead to sighs of relief (out of both nostrils!) for the doer of the deed. Though nasal cleansing has been a technique used by yogis and Ayurvedic practitioners for ages, today it is an often recommended remedy by doctors for treating environmentally induced sinus and allergy problems and other respiratory ailments. Since mouth breathers are a bit discriminated against in yoga class, the benefit of nasal cleansing for stuffy yogis is clear. With allergy season just around the corner, if you haven’t ever felt the relief that comes from sticking a neti pot in your nose and feeling the salty water drain out the other nostril, you should seriously consider it to the alternative of popping more pills. So, if you’re interested, you may be wondering what you need to do to get started. There’s really not much. It’s pretty simple actually. You may want to buy a neti pot, but that’s not even necessary. Many ear, nose and throat doctors suggest using a baby bulb syringe for getting the water into the nose. You can’t get much cheaper. If you decide to go the bulb syringe route, the only other thing you will need is a glass jar to put a homemade saline solution in. While you can buy individual pre-measured packets of saline, here’s a homemade recipe that my sister got from her doctor. Carefully clean and rinse a 1-quart jar. Fill the clean jar with tap water or bottled water. You do not need to boil the water. Add one level teaspoon of non-iodized (“pickling”) salt. DO NOT use table salt. Table salt has unwanted additives. You can ask for pickling salt at the grocery store. Add one level teaspoon of baking soda (pure bicarbonate). Stir or shake before each use. Store at room temperature. After one week pour out any mixture that is left over and make a new recipe. Once you have your mixture ready, all you have to do is squirt one to two syringes of solution per nostril and let it drain into the sink or tub. Check out this clip for a demonstration on how to properly perform a nasal cleanse using a neti pot. The same technique can be applied if you use a bulb syringe. Rinsing your nose with the salt water and baking soda solution washes crusts (gross) and other debris from your nose. Salty water pulls fluid out of swollen membranes. Washing the inside of the nose decongests it and improves airflow. Not only does it make breathing easier, but it helps open the sinus passages. Studies show that this mixture of concentrated salt water and baking soda helps the nose membrane to work better and move mucus out of the nose faster. While the above recommendations have worked for me, there are a lot of websites with even more information on nasal cleansing that you may find useful. I particularly recommend the Himalayan Institute. 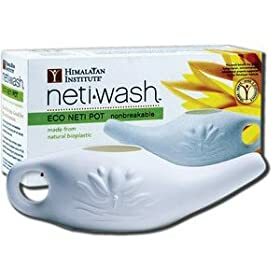 Buy a neti pot at Amazon.com!! Visit the Daily Cup of Yoga Market to find the best prices on yoga books, yoga dvds, yoga music, yoga mats, and yoga clothing.